If you haven’t heard of The Melt Room then where have you been? It’s been featured almost everywhere (Stylist, The Independent, Olive and Mail Online are just a few). I’ve been dying to go to as toasted cheese sandwiches are one of my favourite comfort foods and a Sunday evening fave. 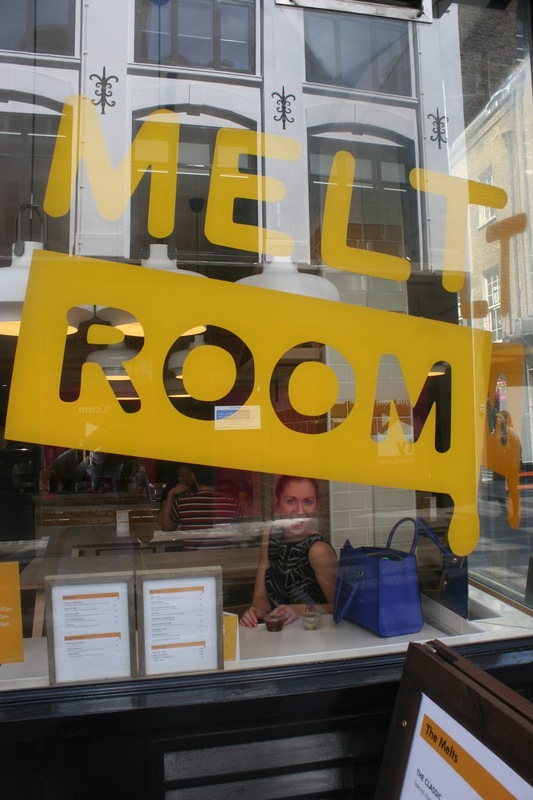 The Melt Room is a very yellow 12-seater cafe located in Noel Street, Soho – minutes away from the bustling Oxford Circus. Each time I have walked past during the week it has been packed so we decided to stop by during a chilled Sunday stroll. It specialises in gourmet grilled cheese sandwiches, obvs. Looking at their menu you can see it was hard to choose our orders. I went for the Pulled Pork Shoulder Melt priced at £5, (tender Pulled Pork smothered in Pommery mustard, real ale and apple chutney & sharp cheddar). The most gourmet cheese toastie I have ever had. It was the best cheese toastie I have ever had (soz Dad). My guest went for the BBQ Chicken, also priced at £5, which is stuffed with Red cabbage slaw and Coastal Cheddar. We decided to be generous and split our toasties in half so we can try both. When it came to picking our favourite toastie we couldn’t agree which shows there is a toastie for every kind of cheese fan. I am a major cheese lover so the sharp cheddar really hit the spot for me making the Pulled Pork was a winner. I may have to make a quick dash on the central line and stop here more often more lunch. Drinks are well priced too. To wash down the cheesy goodness I went for an iced coffee which was just £2 and was a proper iced coffee too – coffee fanatics would definitely approve! If you have more a sweet tooth then there is also an option for you! For dessert we sampled the Nutella and Mascarpone Melt in between Milk Bread (£3.50). Being a Eggs Bennie fan I HAVE to return for breakfast for the Benedict Melt (£4.50). A delicious toastie filled with York ham, Scrambled Egg, Vintage Cheddar and Hollandaise Sauce. Swoon.